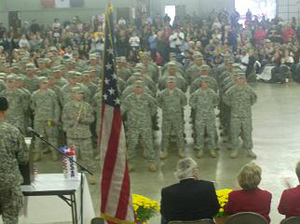 Soldiers are welcomed home in ceremony at Mason City. Transportation Companies were greeted by friends and family members at ceremonies in Audubon, Iowa City, Mason City, Perry and Marshalltown. This was the second tour of duty in Iraq for many of the troops. Both units were previously deployed to the region between 2003 and 2004. Soldier Peter Bieber of Nora Springs says it was a thrill to see so many people gathered on the North Iowa Fairgrounds. “Incredible, incredible, we weren’t really sure what to expect with the weather and everything, but as soon as we got here and saw all the cars and people waving at us on the way in…it was a pretty incredible experience as always,” Bieber said. The transportation companies traveled almost three-million miles over a 10-month period hauling equipment in and out of Iraq. Soldier Chad Holt of Northwood described the experience. “Hot, dusty, long drives…it wasn’t bad, but it’s good to be home,” Holt said.